New Immigrant Community Empowerment's (NICE) upcoming Spring Gala "United in the Struggle for Immigrant Workers' Rights." 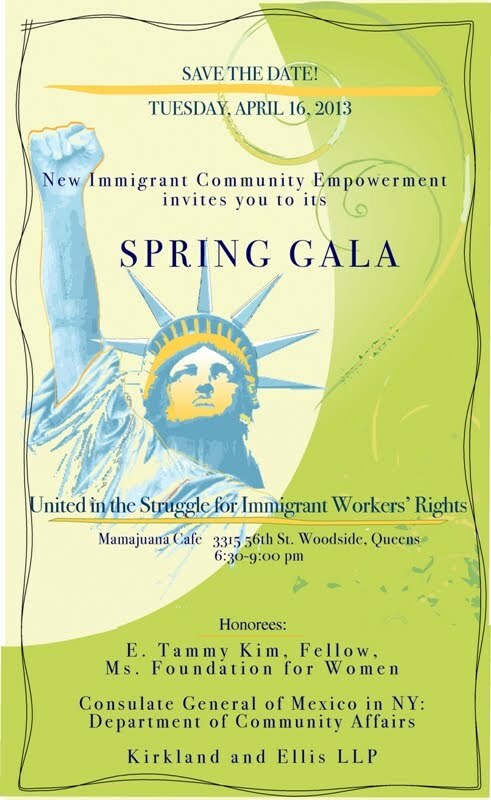 The Gala will take place on April 16th from 6:30 to 9:00 PM, and will be held at Mamajuana Café at 33-15 56th St. in Woodside, Queens. Below is the Gala invite as well as the link to ticket and sponsorship costs. NICE counts on individuals like you to help us realize our vision of a world where all people – regardless of immigration status – live and work with dignity and justice. Thanks and hope to see you on April 16th! To purchase sponsorships and tickets, CLICK HERE!